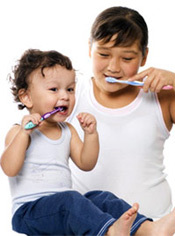 Infants and children are not immune to oral health problems. In 2002, “Oral Health in America: A Report of the Surgeon General” found that dental caries (tooth decay or cavities) is the most chronic childhood ailment – five times more common than asthma and seven times more common than hay fever. In 2005, The Centers for Disease Control and Prevention found that tooth decay is the most chronic disease among children aged five to 17. Oral health problems affecting infants are no less serious. Some babies are born with neonatal teeth (teeth that develop in the first month) that require dental hygiene or a visit to the dentist for their removal. At least one baby tooth erupts by six months of age. And, yes, it requires cleaning. By three years of age, most if not all baby teeth have erupted. Soon after four years, spaces for permanent teeth begin to appear as the jaw, supporting bone structure and facial bones begin to grow. From six to 12, it is typical for your child to have both baby teeth and permanent teeth in their mouth. Mouth Washing: Mouth washing is usually recommended by age seven, provided your child can perform the activity. Orthodontics: Orthodontics may be appropriate by seven years of age. Keep in mind that these age ranges are estimates only; you should follow your dentist's recommendations.